Making their first significant offseason move to help the offense, the Washington Redskins drafted lineman Brandon Scherff with the No. 5 pick in the first round of the NFL draft Thursday night. 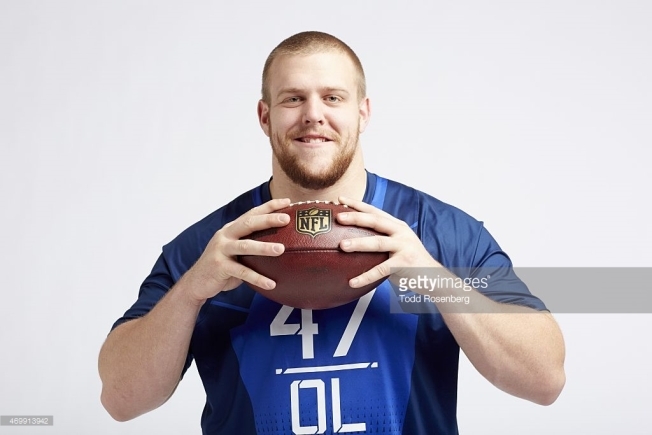 Scherff, listed at 6-foot-5 and about 320 pounds, is new general manager Scot McCloughan's first draft pick with the Redskins, who went 4-12 last season to finish last in the NFC East for the sixth time in seven years. Scherff won the Outland Trophy in college as a tackle, but could be shifted to guard in the NFL. He is considered quite talented as a run blocker but might need to improve in pass protection. The Redskins are expected to use him on the right side of their offensive line. Leading up to the draft, it was thought the Redskins might trade down from the fifth overall spot in order to acquire extra picks. McCloughan said Monday that he'd ``love to get 10-plus'' choices, instead of the seven he started with. But he held onto the fifth pick and got the sort of player who Washington hopes will wind up teaming with left tackle Trent Williams, taken No. 4 overall in 2000, to fend off opposing defenders. This was the first time the Redskins had drafted a player in the first round since using the No. 2 overall selection in 2012 to get quarterback Robert Griffin III. That pick was obtained in a trade with the St. Louis Rams that cost the Redskins a bevy of choices, including first-rounders in 2013 and 2014. Griffin led the Redskins to the 2012 NFC East title and was the NFL Offensive Rookie of the Year, but he tore knee ligaments in a playoff loss to Seattle that season. He's been in and out of the lineup since, because of injuries and coaches' decisions, but McCloughan announced this week that the Redskins planned to exercise their fifth-year contract option on the quarterback for 2016. Until now, most of Washington's offseason changes came on defense. Joe Barry was hired as the defensive coordinator, replacing Jim Haslett, and McCloughan brought in linemen Terrance ``Pot Roast'' Knighton, Stephen Paea and Ricky Jean-Francois, cornerback Chris Culliver, and safeties Jeron Johnson and Dashon Goldson.